Once you’ve set up a process template and set up your steps, at least some of them will probably be “Collect Information” steps. These basically function like online forms – they allow you to have a constituent or someone on your team add new information into the process. 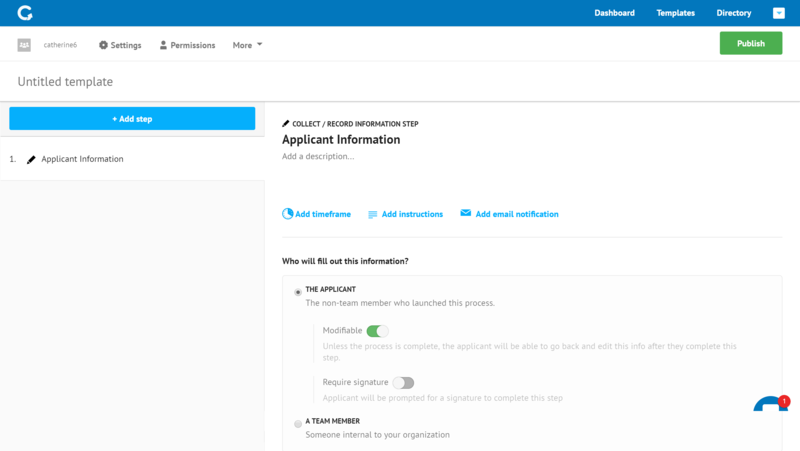 When you start the setup, you'll have the option to decide whether an external applicant (resident or business) will complete the step or someone internal to your organization. You'll also see options to make a step "Modifiable" (an applicant can change their responses after the step is complete) and the option to request a signature when a step is completed (one of CityGrows' premium features). Use this when you expect to receive a short phrase or word. Same as text, but with more space. Use this when you expect to receive full sentences or paragraphs. A number with the option to add a decimal point (45.2, 0.1, 3.14159). Use this for things like measurements and ratios. A mappable address. Our address fields will automatically find the location and plot it on a map. You'll add a list of answers, and applicants will be required to select one answer only. You'll add a list of answers, and applicants will be required to select one or more answers (no answer is also acceptable). For both multiple choice and checkboxes, you can decide which order you want the answers to appear in. Why can't I just use the "text" data type for everything? It ensures that people don't accidentally enter the wrong information. It protects against mistakes. For example, the system will not accept a phone number that is too short or an email address that's missing an @ sign. It allows you to get better insights into how your processes are being used. It allows us to create automatic data visualizations related to the type of data being collected. If you don't see the type of field you're looking for, please get in touch using the chat icon at the lower right of your screen and let us know.